There will be a special attraction for deaf people in theaters nationwide soon. 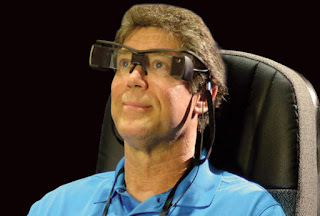 By the end of this month, Regal Cinemas plans to have distributed closed-captioning glasses to more than 6,000 theaters across the country. Sony Entertainment Access Glasses are sort of like 3-D glasses, but for captioning. The captions are projected onto the glasses and appear to float about 10 feet in front of the user. They also come with audio tracks that describe the action on the screen for blind people, or they can boost the audio levels of the movie for those who are hard of hearing. This is a big moment for the deaf, many of whom haven't been to the movies in a long time. Captioned screenings are few and far between, and current personal captioning devices that fit inside a cup holder with a screen attached are bulky, display the text out of their line of vision to the screen, and distract the other patrons. Randy Smith Jr., the chief executive officer for Regal Cinemas, says he has worked for more than a decade to find a solution to this problem. He tells Arun Rath, host of weekends on All Things Considered, that it has been his goal since 1998 "to develop a technology that would allow accessibility to the deaf and blind for every show time, for every feature." Luckily, he had his own "personal guinea pig" at home, he says, in the form of his deaf son, Ryan, now 23. Smith said that as the tech companies would send him new prototypes, he and Ryan would test it out at the movies together, with Ryan giving him feedback along the way. "We'd do that until we got to a point that we felt it was comfortable enough," Smith says. "I've attempted to enjoy a movie with my son so many times over the last 26 years, but to no avail. After watching a movie I would try to discuss it with him. The comments he would make would in no way relate to the plot of the movie and at one point he finally confessed that as he watched the screen, he simply made up the story in his head. He didn't really know what was going on. The fact that I can take my son to a movie when he visits at the end of June is literally bringing tears to my eyes. It would seem silly to most people but I would imagine you understand what it feels like." Smith says he can't express it any better than that.